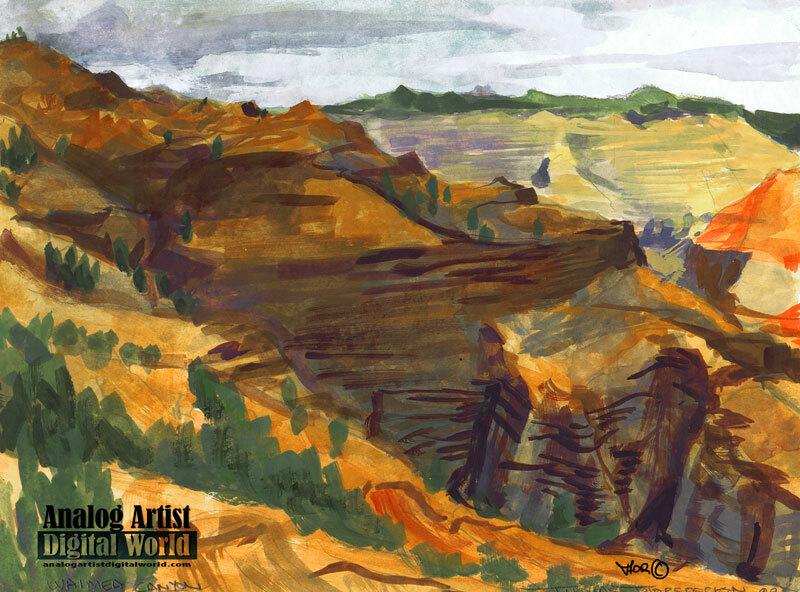 Analog Artist Digital World: Waimea Canyon on Kauai. Kauai is the oldest of the large Hawaiian islands. It is the top of an enormous volcano rising from the ocean floor. With lava flows dated to about 5 million years ago. Roughly 4 million years ago, while Kauai was still erupting almost continuously, a portion of the island collapsed. This collapse formed a depression which then filled with lava flows. In the millions of years since, rainwater from the slopes of Mount Waiʻaleʻale have eroded Waimea Canyon along one edge of the collapse. On the east side of the canyon, the cliff walls are built from thick lava flows that pooled in the depression. Over time, the exposed basalt has weathered from its original black to bright red. The spectacular site is also known as the Grand Canyon of the Pacific. The canyon is ten miles long and up to 3,000 feet deep. Waimea is Hawaiian for "reddish water", a reference to the erosion of the canyon's red soil. The canyon was formed by a deep incision of the Waimea River arising from the extreme rainfall on the island's central peak, Mount Waiʻaleʻale, among the wettest places on earth.